This course is designed for mature students who, upon successful completion of this course you will be qualified to practice this effective and practical therapy. Tuina is the Official Medical Chinese Bodywork therapy that was developed in China over 3,000 years ago and known as needle-less acupuncture. It is an integral part of the healthcare system in hospitals throughout China today. It works with the energy system in the body known as the meridian system. Traditional Chinese Medicine is now a well established health profession. It is a holistic approach that has received wide recognition throughout the world. Subject Description: Tuina is the Official Medical Chinese Bodywork therapy that was developed in China over 3,000 years ago and known as needle-less acupuncture. It is an integral part of the healthcare system in hospitals throughout China today. It works with the energy system in the body known as the meridian system. Traditional Chinese Medicine is now a well established health profession. It is a holistic approach that has received wide recognition throughout the world. 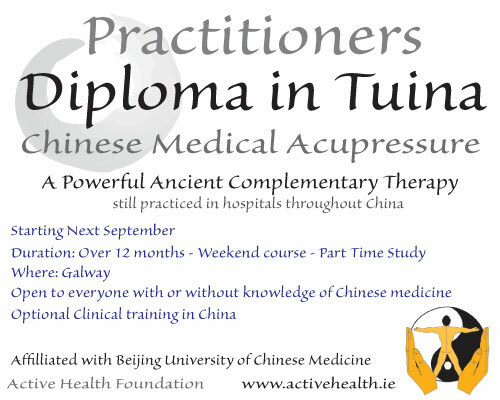 Aim of Course: To enable participants to obtain a Practitioners Diploma in Tuina Chinese Medical Acupressure, which certifies their competence to diagnose and treat a wide variety of health conditions according to the practical and theoretical principals of Traditional Chinese Medical theory in a Holistic way. Entry Level: The course is designed for mature persons with an explicit interest in studying a complementary therapy that they can use in helping others within the community. Text Books: A list of text books, together with a detailed syllabus pack and course timetable is issued on enrolment. Course Content: You will gain a thorough knowledge in Traditional Chinese Medicine, covering the following lectures and practical sessions. History and development of Traditional Chinese Medicine. Practical Extra: A commitment to full (95%) attendance is necessary to meet with Active Health Foundation requirements for examinations. Western Sciences: All the WHO affiliated TCM colleges have taught Western Medical sciences since 1953. These have been taught alongside acupuncture, herbs, and Tuina. Both Tuina and Western Sciences modules run concurrently. Your Lecturers: Hung Tsui Ying has a busy practice in Chinese Medicine in Galway. She is a respected Tuina master from Taiwan and a master practitioner in Chinese Cosmetic Acupuncture, Chinese Nutrition therapy, Gua Sha therapy, Auricular (ear) acupuncture, Chinese Herbal medicine. Tsui Ying lectures extensively throughout Ireland and England. More on Hung Tsui Ying. James O’Sullivan has a busy Chinese Medicine practice in Galway. James also lectures for 5 VEC colleges around Ireland running the under graduate Tuina diploma course, as well as being a visiting lecturer to Beijing and ZheJiang universities in China. He developed the first under graduate Diploma in Tuina in Ireland. Many acupuncturists will know his fresh and hands on approach to TCM. James trained with Hung Shui Chen in Taiwan, a Tuina master practitioner and a living legend in his lifetime. We work with people of all ages who may be in good health but suffer from common problems, such as sports injuries, stress related conditions, headaches, PMT, fatigue, insomnia, Irritable Bowel Syndrome, to name a few. The Tuina practitioner treat health conditions by diagnosing medical patterns of disharmony according to the ancient methods of Traditional Chinese Medicine. This entry was posted in Course, Tuina on February 28, 2013 by activehealth.ie.